It’s the age of the food mashup! The cronut, the sushi burrito and the ramen burger created long lines of eager customers and plenty of buzz online. It was only a matter of time until someone came up with this beautiful concoction: the sushi doughnut. Fountain Valley’s Project Poke in Orange County, California, created the 4-inch snack that is doughnut only in shape. Putting rice — made with extra vinegar, sugar and salt for optimum stickiness — into doughnut molds, pipe in spicy tuna, avocado or imitation crab filling, add more rice to complete the shape and garnish with sesame seeds, masago, cabbage, cucumber and salmon or tuna (or BOTH!). They’re sold for $4.50 each. Sneak peek alert!! SUSHI DONUTS are now a thing. ?? You heard it here first! – Sushi rice donuts filled with spicy tuna or avocado, topped with salmon, tuna and more. Debuting at Project Poke this Friday!! You're welcome. ? #TanayasTable #projectpoke – Snapchat for behind-the-scenes: ? MsTanayaG – Tag your friends you want to try this with! ?? Thanks for sharing @projectpokeco with the world yesterday, @thisisinsiderfood ! Stop by tonight and grab yourself a sushi donut. We close at 9pm ?? ? @projectpokeco ? @thisisinsiderfood & @feastie.boys ?LEAVE US A COMMENT? 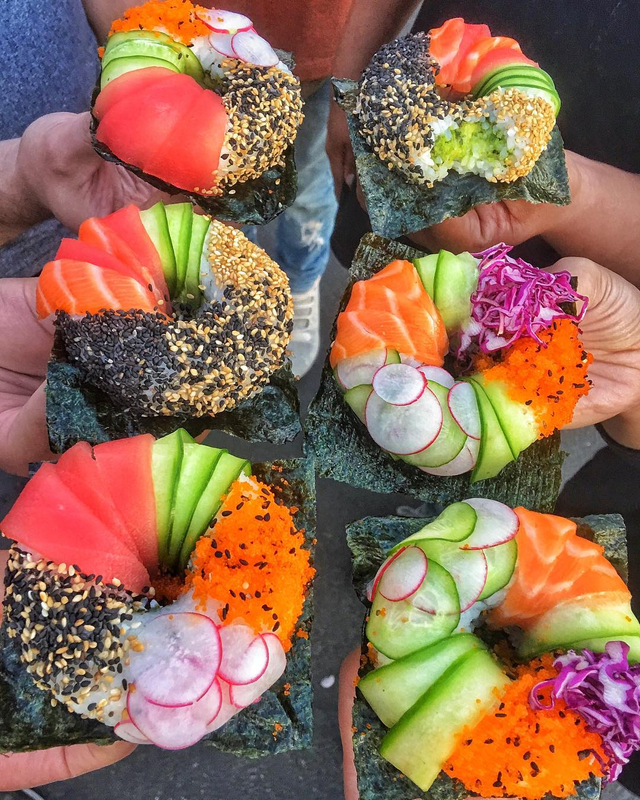 Ever since the hybrid food was covered in a BuzzFeed video published Tuesday, February 21, Project Poke has had about 100 sushi doughnut customers lined up before the shop opens. The team is hiring more help as quickly as possible so that it can meet the demand. “We’re just trying to soak it in right now because it’s been pretty surreal to see it happen,” Nguyen says. But the 32-year-old and his fellow co-owners were known in the Orange County foodie scene before the advent of this viral creation. They’d become famous three years ago for their ice cream–filled doughnuts, on sale at their sister restaurant, Afters Ice Cream parlor. Nguyen’s knack for inventive foods continues to be a winning strategy. If you manage to make it to the Project Poke, Nguyen can offer advice on how to eat the sushi doughnut.